No registration/Tai Kwun Pass is needed to enter Tai Kwun. Just say "walk-in" or "visiting Yuen's Tailor shop" at the gate! Turn right after exiting MTR onto a narrow street. Then turn left (1st) onto Theater Ln (pedestrian only). Walk straight, crossing the busy Queen's Road Central (not a trammed road), onto D'Aguilar Street. Turn right (2nd) on Wellington Street. 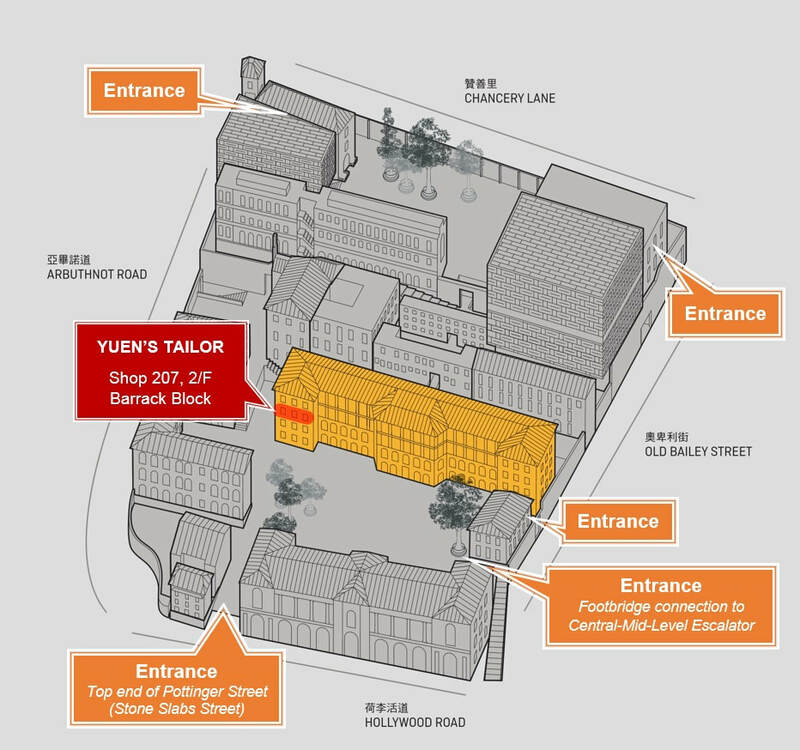 Walk along Wellington and turn left (2nd) onto Pottinger Street (Stone Slabs Street 石板街). There is a Tai Kwun entrance at the end of this segment of Pottinger Street. Via footbridge on 1st Floor, exit IFC and walks towards Hang Seng Bank Head office, Central Market and then entering the Mid-Levels Escalators to enter Tai Kwun via a special footbridge connection. When inside the Barrack Block (the same building as the visitor center), either use the passenger lift, or locate the two side staircases to access 2nd Floor. We share the same floor with other brilliant, local shops like Phoenix Sweets and Harrison Wong.